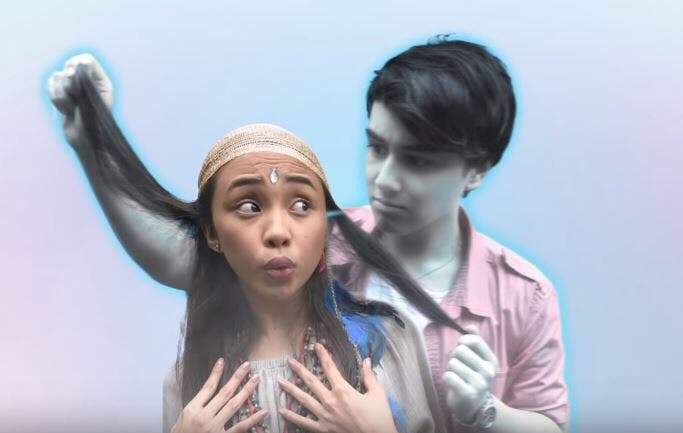 Maymay Entrata and Edward Barber bring a magical mix of drama and thrill as they return to television in their first starring TV team-up for “Wansapanataym Presents: Ikaw ang GHOSTo Ko,” which airs this Sunday (July 22). Maymay plays Espie, an orphan who pretends to be a fortune-teller to make ends meet. After getting into an accident, her life changes as her third eye opens, which gives her the ability to talk to the dead, even to her late father Pidiong (Jojit Lorenzo). But her sixth sense also reopens a forgotten chapter in her life as she crosses paths with Vincent (Edward), the man who toyed with her feelings when he was alive, in an unexpected encounter. Despite their bitter past, the troubled ghost will ask for Espie’s help so he can reconnect with his mother and finally tell the truth behind his untimely death. This marks the start of a new journey in Espie’s life and a chance to put her ability to good use, instead of deceiving people as a fortune-teller. Will Espie be successful in helping Vincent? Will life and death hinder them from falling for each other? Also part of “Wansapanataym Presents: Ikaw ang GHOSTo Ko” are Patrick Quiroz, Luis Hontiveros, Yayo Aguila, Neil Coleta, Wilma Doesn’t, Clarence Delgado, Jojit Lorenzo, Hannah Ledesma, Josh Ivan Morales, Noel Colet, and Darwin “Hap Rice” Tolentino. Don’t miss the values shared in “Wansapanataym Presents: Ofishially Yours” on ABS-CBN and ABS-CBN HD (SkyCable ch 167). More more projects pa sana ang darating sa kanila at award pra makatulad din sila sa kathniel.at sana maging sila nalang na dalawa sa totoong buhay.godbless MAYWARD. Ganda din ang wansa nila go go go mayward hintay na kami sa teleserye niyo more projects to come. Mayward ang number one ngayon ang daming followers talo na a ng Kathniel.